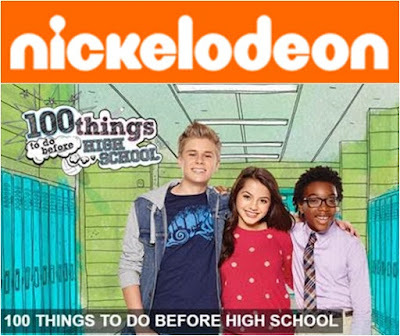 Nickelodeon has just recently premiered a popular new live-action series, 100 Things to Do Before High School, which has garnered positive attention in the US. Three best friends are determined to make the most out of their middle school years using an ever-expanding list of challenges as their guide in Nickelodeon’s newest live-action series, 100 Things to Do Before High School, debuting Monday, 11 January 2016 at 5pm (TH), 6pm (HK/SG), 7.30pm (PH), 7.45pm (WIB) and 8.45pm (MY). The series will air regularly on weekdays. 100 Things to Do Before High School follows the comedic adventures of 12-year old CJ Martin (Isabela Moner) who always dreamed that high school would be the greatest years of her life. After her older brother warns her that life after middle school is not quite the teenage dream, CJ becomes more committed than ever to strengthen her friendships with her two best friends, Fenwick Frazier (Jaheem Toombs) and Christian “Crispo” Powers (Owen Joyner), before high school ruins their lives forever. Together, they embark on a bucket list of adventures that help them overcome class cliques, terrifying bullies and clueless teachers. For CJ, Fenwick and Crispo, growing up means trying everything and taking chances while they still can. In the series premiere, “Find Your Super Power Thing!,” CJ feels like she doesn’t have any abilities or talents that makes her exceptional and teams up with Fen and Crispo to discover their “special thing.” As CJ, Crispo and Fenwick work to find their talent, they realize mastering the things on “The List” is always easier with friends by their side. Kakak dah tak ada siapa nak ditemankan utk tengok ni semua. Adik pun dah tak ada kat rumah. Gred apa Solat Kita?? Jom Check!! Ajar Anak Buat Kerja Rumah | Ibu Kejam Ker?? ?